I’ve been busy putting the finishing touches on my latest novel for the last couple of months, and I’ve finally brought it to life! 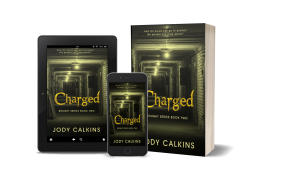 If you love emotional dystopian drama in the strain of psychological thriller, you’ll love Charged, the second book in my young adult dystopian thriller series, Bought. This book, my fourth young adult novel, was, by far, the hardest, most emotional book I’ve written. I thought my debut novel Shattered was difficult to write (it was an emotional roller coaster ride for me), but Charged has taken the top slot. There are deeply emotional scenes, adrenaline-pumping action scenes, and lots of tension amongst all the main characters. Fira Moseley created the antidote for the lethal injection the NRC was about to use on the villagers. But things went terribly wrong at the business district. Now Fira is faced with a difficult decision. If she agrees, she’ll forego her beliefs in what is right. If she declines, she’ll suffer the consequences. Little does she know, she’s not prepared for what the new mayor will throw at her. The trip to the prison weeks earlier had been bad enough. But this will leave her broken and struggling to overcome new fears and setbacks at a time when her skills are needed most. 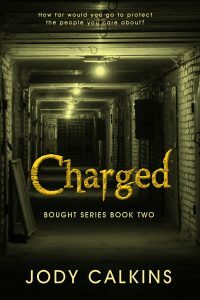 Charged is the deeply emotional second book in the BOUGHT series, the new young adult dystopian psychological thriller. Fira and Devon’s story continues to have a special place in my heart, and I sincerely hope readers fall in love with it as much as I have. When I started writing Bought, the first book in the series, I wasn’t planning on expanding it past a standalone novel, but as I wrote it, the story developed more and more. And now I can’t get enough of Fira (pronounced FEAR-ah) and Devon. Each piece of their story is interconnected to form one giant puzzle that spans across the series, which is now a five-book series (I still have a feeling their story will go beyond that!). I HELD MY HEAD in my shaking hands as the van drove off. Tears spilled out, falling on my jeans. The look on Devon’s face played over and over in my mind. His furrowed brows, his pained expression, the glimmer in his eyes. We had just perfected the antidote. The only thing left to do was get it to the villagers before the government activated the lethal dose. We had been so close to heading back to the village to deliver it to the infirmary. Our work was nearly done. Then the guards caught us. And then I was getting transported back to the city. I would be punished for assisting the villagers. But all I could think about was whether or not Devon had made it out of the business district alive. I heard the explosions behind us as we drove away. The lab was gone. But had they gotten out? Had Hezekiah pulled him out of the building and away from the bombs? Had they gotten the paperwork so they could replicate the antidote? If the villagers didn’t receive the antidote, then all of our work had been for nothing. Thirty minutes later, the van stopped and then the side door was sliding open. Jenny, the female guard, gestured for me to get out. She gripped my arm and led me into the research center through the back door. Then she took me to the basement and we walked down a dark hallway. At the end, she swiped a key card and then pushed through a restricted section. Inside, there were metal doors lining the hallway on both sides with slots which looked big enough for a food tray to pass through. Then I remembered what this was. This was where they housed the test subjects for their biological research. Devon had walked me through this section during Mayor Wilson’s murder investigation. At the fifth door on the right, she turned the knob and then pushed the door open and gestured for me to step inside. I swallowed hard as I stared at her. “Get in,” she said, nodding her head toward the door. My legs felt too heavy, unable to move. With an aggravated sigh, she grabbed me by the arm and dragged me into the room and then let go. I stumbled and caught myself on the edge of the bed. I sank to the concrete floor, curling my legs underneath me, as she left the room and closed the door. I rested my forehead on the metal frame of the bed. Then I took a few deep, calming breaths and looked around the small space. In the back corner was a toilet and small sink. I pulled myself off the floor and sat on the thin mattress of the bed. My legs shook uncontrollably as I sat there. I closed my eyes and dropped my head in my hands as I considered the situation. Where did the guard go? What was going to happen to me? Another thirty minutes later, the female guard walked in and closed the door behind her. She stood with her back against the door and her arms folded over her chest. Her gaze drifted to me for a brief moment and then she looked away. My stomach twisted tighter when I saw she was carrying a metal-detecting wand, a plastic bag, and a paper gown in her arms. It was the prison all over again.